Arriving in camp in September of 1896 Mr. Petter immediately set up his assay shop and went to work. However in January of 1898 he lost his shop in the fire which burnt most of the business district of Randsburg. He rebuilt only to be wiped out again in the May 1898 fire. Mr. Petter was considered to be a very fine assayer and was quite knowledgable of the local ores. He also published several articles on mining and geology of the region. Mr. Petter’s advertisement appeared in the Randsburg Miner in 1898 after the second fire. The editor stated elsewhere in the paper that A. J. Petter had began the rebuilding of his assay office on Thursday after the fire and was again ready to do business. Mr. Petter’s assay shop was on Rand St.
Mr. Flood is listed in the 1898 business directory as being a Chemist and Assayer in Randsburg. The first bakery in town appears to have been the Los Angeles Bakery, which was run by John Potts in 1896. By 1898 it appears that the name of his bakery had been changed to the 16 to 1 Bakery. The Sixteen to One Bakery was listed in McPherson’s History of Randsburg published in March of 1899, however a proprietors name is not listed. The below illustrated token proves the connection between John Potts and the 16 to 1 Bakery. Sixteen to One was a campaign slogan of the 1898 election dealing with the government having the ability to set the price of gold and silver at sixteen dollars per ounce for gold and silver at one dollar per ounce. Although both the 1896 and 1898 Great Register of Voters shows Mr.. Conway's occupation as a butcher, the Randsburg Miner, in December of 1896 showed him as the proprietor of the Boston Bakery. The Boston Bakery was located on Rand St. It is the third building on the right in the above photo of Rand St. showing Petters assay shop. The Los Angeles Daily Times reported in January of 1897 that Johnson and Wedehouse who hailed from Texas had but in a oven and were opening a bakery. Mr. Wedehouse had brought his family with him and was putting up a small house on the lot which he had purchased next to the Skating Rink. Henry Rott was a German immigrant who became a naturalized citizen in 1865 in Indiana. At the time of the 1900 census he was 57 years old. 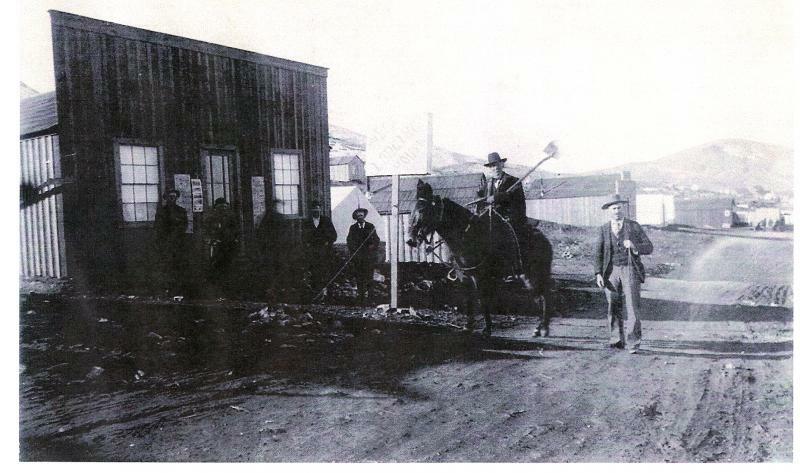 It is not known when Henry Rott first arrived in Randsburg, however the picture below is known to have been taken before the January 1898 fire. ORIGINAL STEAM BAKERY ON BROADWAY AVE.
Collection of the Naval Air Warfare Center, China Lake, Ca. He was first shown as a baker and confectioner in the 1898 Great Register of Voters. A John Roth is shown as a baker in the 1902 business directory, however the author considers this to be an error in the directory and believes that the intended listing was for Rott. Henry apparently ran the Steam Bakery by himself until February of 1904 when Mrs. W. O. (Martha) Lidy of Johannesburg bought a half interest. In 1905 they purchased an Edison Heating and lighting plant for the bakery. In October of 1907 Mr. Rott was severely burned in a fire that occurred in the bakery, he recovered however and continued in business through 1922. By 1924 Henry had left the bakery business and was trying his hand at mining. It is generally thought that in later years (after 1904) the Steam Bakery was located in the building that presently houses THE JOINT on Butte Ave. Henry passed on in June of 1927 in Los Angeles at the home of his old friend Otto Deisler. His widow and two married daughters survived Henry. Suits-Sullivan Business Directory for 1898 shows Otto Deisler as the proprietor of a bakery in Randsburg. As the information for the business directory for any given year is normally collected in the prior year so that the directory may be published early in the year, it is assumed that Otto was in fact in Randsburg in 1897. 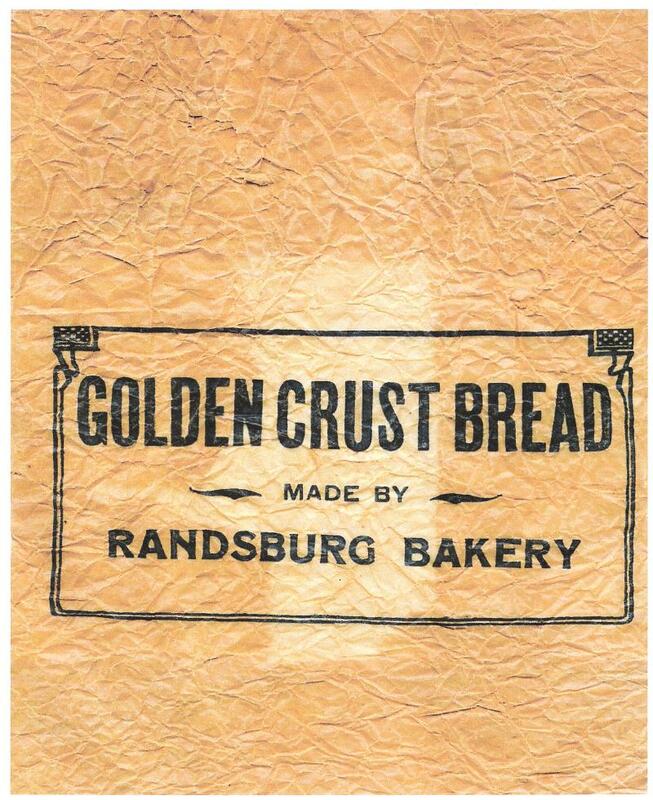 In December of 1907 Otto and his wife sold the Randsburg Bakery to a Mrs. Lidy. Steam Bakery in 1904. In December of 1907 for a price of $125 she purchased a 51’ x154’ lot on Broadway where the Randsburg Bakery was located and for an additional $400 she purchased a half interest in the Randsburg Bakery from Otto and Martha Deisler. It is not known whether she continued her partnership with Henry Rott after this time. George is shown in the 1908 Great Register of Voters as a baker. It is not known whether he was working for someone or if he had a bakery of his own. Like George Jordan it is not known whether Frank was working for himself of was an employee of one of the other bakeries. He was however listed as a baker in the 1910 Great Register of Voters. According to the advertisement, shown here, that appeared in The Rand District News on 7 June 1922. 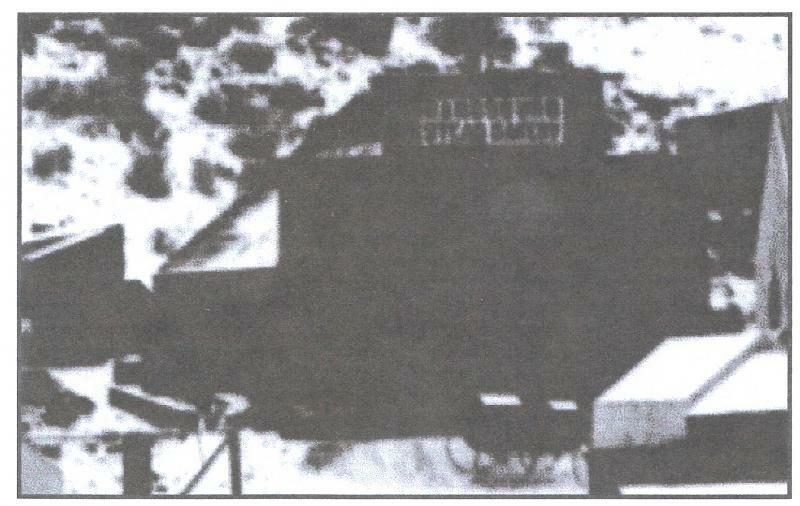 According to information recorded in a log of old timers visiting during one of the Old Timers Celebration held in Randsburg, by Mr and Mrs. Silas Z. Morgan, they came to Randsburg in September of 1921 and left on 29 December 19129. Silas was the proprietor of the Randsburg Bakery during that period.. Even the rough and tumble mining camps of the late 1890’s had a demand for barbers. Randsburg had the unique advantage of having a lady barber, which undoubtable led to a much more well groomed group of miners and muckers than many of the earlier camps. If the photo below is in fact the barber shop of the lady in question, it may account for the long line of customers waiting to indulge in the tonsorial delights of her services. Louis is listed in the Great Register of Voters as a Barber in 1896. The business must have been as booming as the camp for he quit barbering and opened a saloon by 1898. Mr. Griffin was shown as pursuing the occupation of barber in both 1896 and 1898. Thomas was a barber in Randsburg as early as 1898 and continued in business in 1899. Mr. Ruffhead found a home when he came to Randsburg in 1896. A native of England, who was naturalized as a citizen of the United States when he was 21 Years of age, William was 29 years old when he came to Randsburg. In 1904 his shop was located next to Thomas McCarthy's store, in the general vicinity of the buildings to the left of the present Randsburg General Store. In 1913 he purchased the barbershop between the Rand Mercantile and what is now known as the White House Saloon. 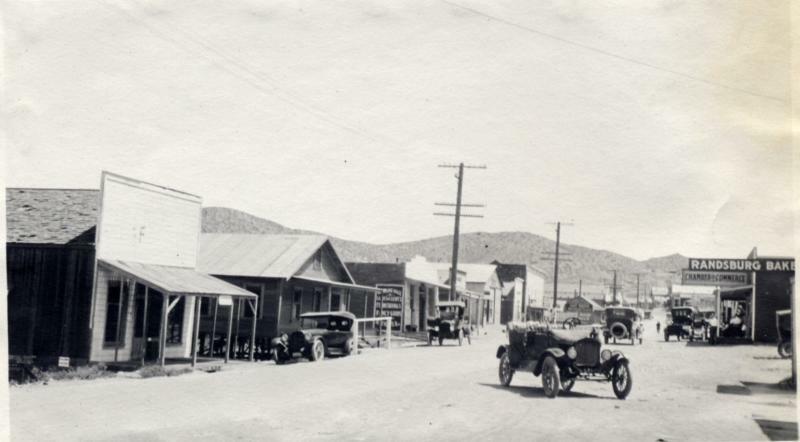 During the rush to Skidoo in the Death Valley area in 1907 Mr. Ruffhead purchased a lot in that town and may have relocated there temporarily. He was, however shown as continuing to do business in Randsburg in the 1908 through 1924 Grand Register of Voters . Mr. Tenney, a native of Minnesota, started in the barber business in Randsburg in 1897 prior to the "Big Fires". It was located between Louie Stoll's and the Asher Building. In the second fire of 1898 sticking a case of dynamite under it to try and create a fire line and stop the fire blew up the building. While it is not known if it was blown up or burnt, the results were the same in the 1903 fire, when it is listed as being one of the buildings burnt. Mr. Waugh states his occupation as barber in the 1898 Grand Register of Voters. Geo. W. McPherson in his pamphlet The History of the Rand Mining District, lists a Cy Wall as being a barber in Randsburg in 1899. Cy Wall and Cymo Waugh are thought to be the same person. Nelson is listed in an 1898 business directory as being in the barber business in Randsburg. It is assumed that he was in fact in business as early as 1897 in order to be listed in the 1898 directory. Like Mr. Nelson above Mr. Henderson was also listed as a barber in the 1898 business directory. Reported his occupation as a barber in the 1900 Census. Joe was 15 years old and lived with his mother and stepfather Robinson Colliver. Joe had been unemployed in 6 of the last 12 months. Walter, a 24-year-old native of California, is shown in the 1900 Great Register of voters as a barber in Randsburg. Charles A. Small, a native of Nebraska, and his wife, a native of California, came to Randsburg as newlyweds in 1900 where he pursued his trade as a barber. Mr. Windisch and his wife arrived in Randsburg in July of 1904 and opened a barber shop on Butte Ave., across from the Houser Hotel. This is most likely in the location of the present barbershop, which is currently an antique and second hand shop. The Windischs also offered "Ladies and Gents" tailoring. Louis died suddenly in May of 1906 at the Pacific Hospital in Los Angeles. In addition to his wife a two-year-old son survived him. According to the Randsburg Miner, Mr. Baker was a barber in Randsburg in 1904. It was reported in the Randsburg Miner that in June of 1904 Mr. Kelso purchased Charley Davis' barbershop with the objective of pursuing that business. Al Dominguez worked as a barber in Randsburg as early as 1910. In 1912 he bought out Archie Boon's barbershop. W. W. Moore is reported as having taken over the shop of Al Dominguez in October of 1914. Archie Boon was in the barber business in Randsburg at least as early as 1912. He sold his business to Al Dominguez in October of 1912 and moved to Bakersfield in March of 1913. Mr. Moore and his family came from Los Angeles in October of 1914 and took over the shop of Al Dominguez. He stayed in Randsburg until at least 1916. According to the 1916 Great Register of Voters Mr. Victria was a barber in Randsburg. The 1918 Great Register of Voters shows William Price's occupation as a barber in Randsburg. Paul is listed in the 1924 Great Register of Voters as a Barber in Randsburg. George is listed in the 1924 Great Register of Voters as a Barber in Randsburg. The 1924 Great Register of Voters shows Charles occupation as a barber in Randsburg. According to the 1900 Census Grace was a beautician in Randsburg. Miss Mcleon conducted a hairdressing parlor in her residence in 1914. She offered all the latest in styles and methods and charged 50 Cents. George started in the blacksmith business in Garlock in 1896 and later was in business in Randsburg. 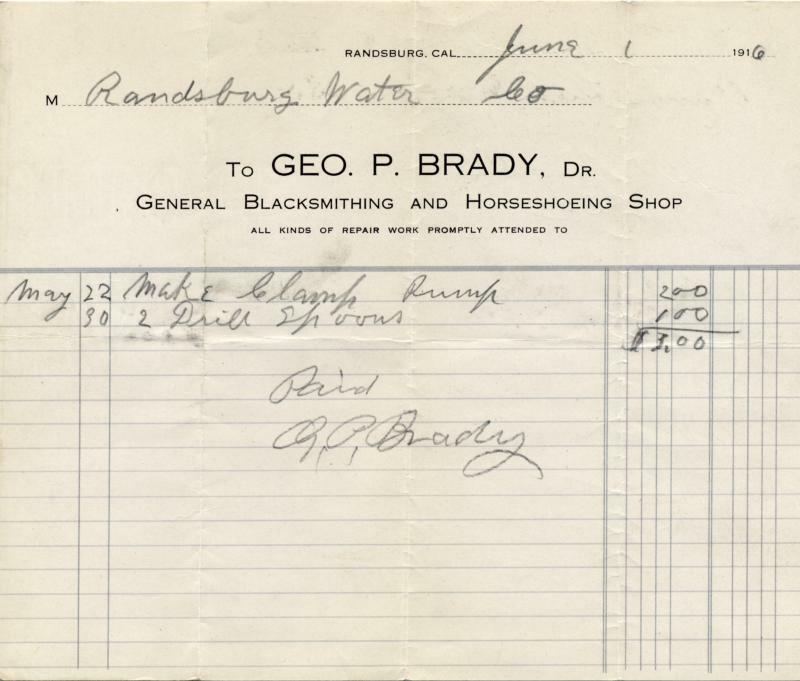 The earliest entry for George Brady that has been found in the account ledger of the Rand Mine Co. on page 13 shows that he was paid $11.20 for blacksmithing services. In 1904 for a short period of time he left the desert and went to Los Angeles. After several months he returned and bought and interest in the Houser blacksmith shop. He obviously stayed in Randsburg in the Blacksmith business for sometime as is evidenced by a receipts dated 1914 and 1916 shown below. A native of New Jersey Mr. Staley came to the desert from Bakersfield at the age of 62 to get a fresh start. 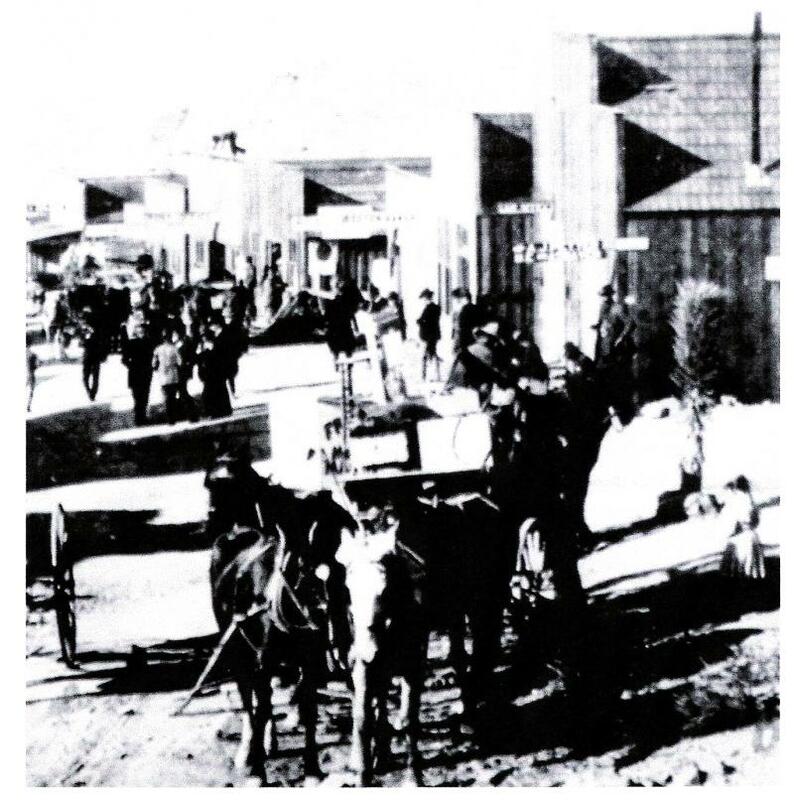 Settling first in Garlock, he however moved to Randsburg in August of 1896, making him one of the earlier pioneer merchants of the camp. 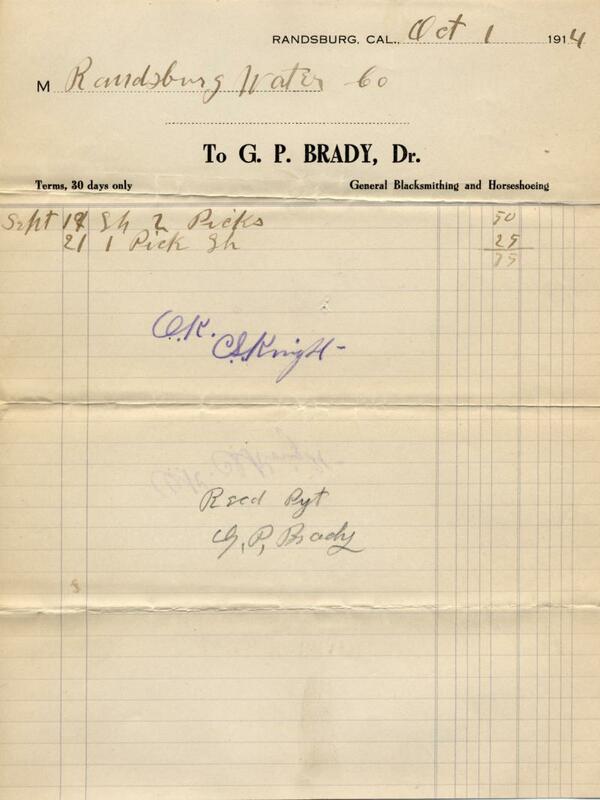 An entry on page 6 of an account ledger of the Rand Mine Co. (Predecessor to the Yellow Aster Mining & Milling Co.) show that A. Staley was paid $6.50 for blacksmithing services on 6 August 1896. In 1897 the family appears to have left camp for a while. The Daily Californian reported in its News from the Desert column that: “ Homer Staley returned to camp for a few days last week and stated that the Staley family got only as far as Bakersfield on their journey, when the whole outfit got stuck as term trial jurors and had to stay. Then Dad got stuck on a goose farm and bought that, so Homer thinks it doubtful if they ever reach the trout brooks and haunts of the grizzly bear in the north country. They will all be back in Randsburg eventually.” And make it back to camp they did, at least “Dad” and Homer as they are shown in the 1900 census. Staley Ave. which shows on the old maps as being in the location of the present Redrock-Randsburg Road was named after this family and remained as Staley Ave. until the late Seventies when the county arbitrarily changed its name. It is not clear whether Homer was a partner in the business with his father or just an employee. In the 1900 census he is shown as having been unemployed for the past twelve months. This would make it appear that when the Staleys returned to Randsburg they did so as employees and not as business owners. Sometime prior to February of 1898, Mr. Poole, a longtime blacksmith from Fresno, located his blacksmith shop in a town where the streets were paved with gold. Or at least it would seem so according to the Daily Californian, who reported in April of 1898 that "Another rich strike has been made in the street where the water pipe ditch was dug. This time on the Lexington Claim, just East of E. A. Poole's blacksmith shop; it is a small stringer about six or eight inches wide that horns ""like a house a fire"" and what it will turn out is yet to be demonstrated." 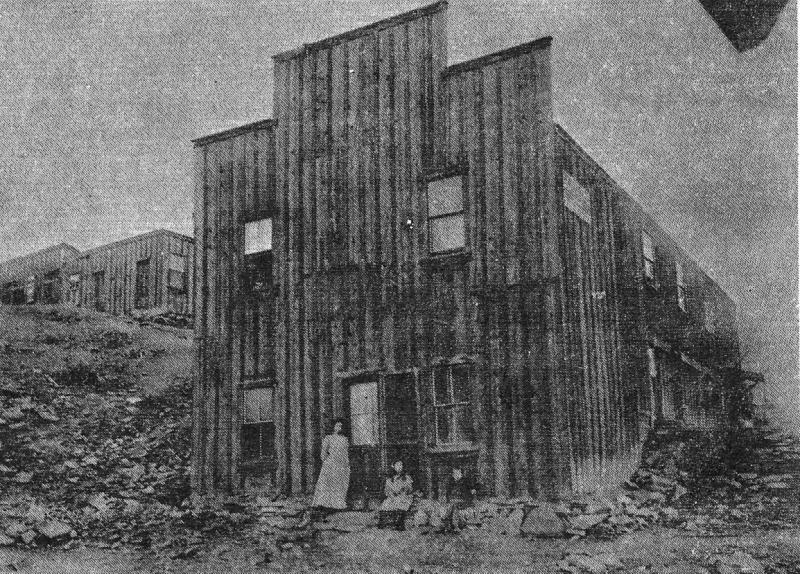 Mr. Poole's blacksmith shop was located across from what is now Charlie's Ore House on Butte Ave., approximately where the Parker’s Powder Room is presently located. Roberta Starry in her book Gold Gamble states that Poole's blacksmith shop was burnt in the fire of May 6, 1898. Whether or not Mr. Poole recovered financially from this blow is not clear, however his name is not found in the 1900 Census. Andrew Mcnitt and a Mr. Fitting apparently bought out "Dad" Staley as one of "Dads" receipts that have survived, which is in the collection of the Kern County Museum, has "Dads" name marked out and the names of Mcnitt & Fitting written in. An entry in a ledger book for the Yellow Aster mine in July of 1899 lists both McNitt and Fitting. In 1897 A. Mcnitt was mining in the Rademacher District. No additional information has been found on Mr. Fitting, however Andrew Mcnitt was still in town in the blacksmithing business in 1900. He was listed as a native of Michigan, was married to Mary E., a native of California, who was 33 years old. Mr. McNitt was 36 years old in 1900. Mr. McNitt stayed in Randsburg in the mining business until Dec. of 1903, when he left to go to Watsonville, Ca. A 55-year-old native of Wisconsin, George Davy, is listed in the 1900 Great Register of Voters as having a blacksmith shop in Randsburg. Authors note: The blacksmiths listed in this book are those who's sole business was blacksmithing. Obviously there were other blacksmith such as the Houser Bros. and C. G. Illingworth, who had multiple business interests. These individuals are covered in other sections of the book in relation to their primary business. Other blacksmiths may very well have been in business for themselves during this period but the author has located no evidence of their business. Three photos have been found of the W. A. Henderson Blacksmith shop. The shop was located on Butte Ave between the Bank Building (Illingworth/Jewell Store) and the Opera House (Miner’s Union Hall). Boarding houses provided meals to the people who resided in them. Rooming and lodging Houses did not provide meals. Some of the boarding and lodging houses changed status depending on whom was running them. Whether a business was called a boarding house, lodging house, rooming house, or a hotel seemed to be more or a whim of the proprietor than an actual distinction of services except for meals. Some other services were provided by some of the ladies who listed their profession as boarding house keepers. The new Rand Lodging house on upper Butte Ave. had every room occupied this week for the first time since it was built, and all from the outside. Mrs. Kerns, formerly Mrs. Freeman, moved her boarding house over from Goler in April of 1896, and most likely was the first boarding house in the camp. The boarding house was called the "Miners Home". By September of that same year she had built on a twelve-room addition and was calling her place of business the Hotel Rand. Mrs. Kerns enjoyed a fine reputation for her meals and her housekeeping and stayed in business in Randsburg until May of 1897 when she moved to Tehachapi. In November of 1896 Mr. Genshlen of Los Angeles in partnership with E. Hannah of Lancaster purchased the Randsburg Boarding House, it is unknown who they purchased it from. By December of that same year they had changed the name to the Hollenbeck Hotel. Mrs. Harrington came to Randsburg in the fall of 1896 and is credited with building the Russ House. In an 1899 listing of Leading Business Firms of Randsburg under lodging houses there is listed both the Russ and the Harrington, the Harrington House was listed in the accounts of the Jan 20, 1898 fire that destroyed Randsburg. The Harrington House set at the junction of Rand and Broadway on the North-West corner. Whether Mrs. Harrington actually built the Russ House or later acquired it is not really clear. However, at the time of her death in January of 1906 she owned the Russ House. Mrs. Harrington was a widow and was 60 years of age when she passed. She was survived by two daughters; a Mrs. C. A. Dunby of Copperopolis Cal. and Mrs. H. A. Morgan of Wilcox Arizona.
" A most enjoyable dance was held in the O. K. Lodging House..." this was in December of 1896. No other mention of this lodging house or who owned it during this period has been located. “.... I was just a kid at the time and had more money to spend than I knew what to do with. Mother would put and extra piece of pie in a boarder’s lunch pail, and when he brought it in at night the handle would hardly hold the pail up, it was that heavy. I’d relieve them of the bucket before they went into the dining room for dinner and dump the contents into a box out back. We got a share, and probably the rest went to pay the fellow’s board bill, which was $25 a month." This practice was prevalent in the early mining towns and let to many arrests. In Randsburg it was reported that in 1898 the mine was loosing as much as $2,500 per month which would be equivalent to approximately $50,000 per month at today's values. The Daily Californian reported in April of 1898 that " George Calladine and Oliver Lefevre and his wife were arrested today, charged with stealing ore from the yellow aster mining company. Warrants are out for three other parties, but two of them, Jim Adams and another man, skipped out last night, taking over $600 with them." Wives of their miners trading gold dust in at the local stores aroused the Yellow Aster suspicions. Copyright 2010 RAND DESERT MUSEUM. All rights reserved.